Del Campo – We Got What We Deserved! Sax – Would You Like Some Burlesque With That? VH1 and I finally made our way to Nopa last night. Nopa is one of the seven jewels of the Knightsbridge Restaurant Group. The location is prime, right smack in the middle of Penn Quarter next to the Spy Museum replacing the former Zola restaurant. The interior is updated with warm colors and tone. The bar area is swanky with small tables and a indented cozy area across from the bar. Nopa has a great dinner menu and also serves Sunday Brunch with an infinite mimosa option. I definitely plan on checking that out soon. A great idea for upcoming Mother’s Day. So we arrived early and started with wine at the bar – they have happy hour. The team was great, very down to earth and professional from the bar to the dinning room. It was extremely difficult to make a decision on any of the courses (except dessert). I think you can pretty much throw a dart at this menu and end up happy with your choice. We bypassed the raw bar, ordered a bottle of the Cabernet and started with Duck Confit and Hamachi Tartare. The Hamachi was accompanied with ginger and wasabi that was whipped so light and heavenly. I’ve really never had anything like it. The duck was great, very tender and moist. Choosing the second course was sheer agony but we finally went with the Pork Belly and Luis recommendation of Chilean Sea Bass. The Bass plate included Wasabi Caramel, Japanese Eggplant and Sweet Potato Purée. I’ve never had this type of eggplant and frankly can’t remember the last time I saw eggplant of any kind on a menu. The bass texture was very interesting in that it was of course meaty but very tender. Luis mentioned that its brined in some type of vinegar. The pork belly was sinful but worth it. I hardly needed to chew it because it practically melted in my mouth, almost too good to share! I hear the short ribs are a must so I need to get back to try them soon. Dessert was a no brainer – red velvet ice cream and Baked Madeleines. Yes for real they have red velvet ice cream with cheese cake. FABULOUS! I highly recommend Nopa for the location, team and food. Take the metro red line to Gallery Place. Enjoy! Take a look at my review of Ardeo + Bardeo here. Located on the outskirts of Chinatown I enjoyed just about everything about Del Campo. The location maybe a little tricky for folks because normally when you mention ‘I’ street in this town folks head towards foggy bottom. That’s what happened to CS who arrived a little late which caused me to move the reservation back twice. No worry, everyone was extremely accommodating and VH1 and I decided to hang out in the bar area for a little nosh and wine. Del Campo actually has a happy hour with discount drinks which is not a given in DC so we scored a few before finally moving over to our table. I arrived pretty early, about 5:30 and there was plenty of space to sit in the bar area but by 6:15 it was standing room only. This space is very nice. The setting is very modern and sleek with dining areas sectioned into at least 3 distinct areas not including the main bar and a seating area that overlooks the gallery kitchen. Hmmm, seems like I am forgetting something but we enjoyed everything! Well actually CS didn’t care for the Veal or Sprouts so VH1 and I have scheduled an intervention because clearly she needs her head examined. Its not our fault we ordered so much its who ever planned the menu. I think they have everything here except my favorite, Duck but they have 10 sides, eight types of steaks and five different choices of ceviches so please don’t come here if you are counting calories. My favorite was the, wow, just realized I was about to list half the list but I will just pick 2 things…..Sweet Potato and Grilled Halibut and the Crostini was hard to share. The theme is South American and Del Campo has an extensive selection of beef which we did not partake as we wanted to leave something to look forward to on our next visit which can’t come soon enough! While they are open for lunch and dinner there is no brunch, so I’ve started an online campaign @NoshDC in the hopes that one day ……..
Its a short walk from either the metro green line at Mt.Vernon Square or red line at Gallery Place. Let me know which dish is your favorite. 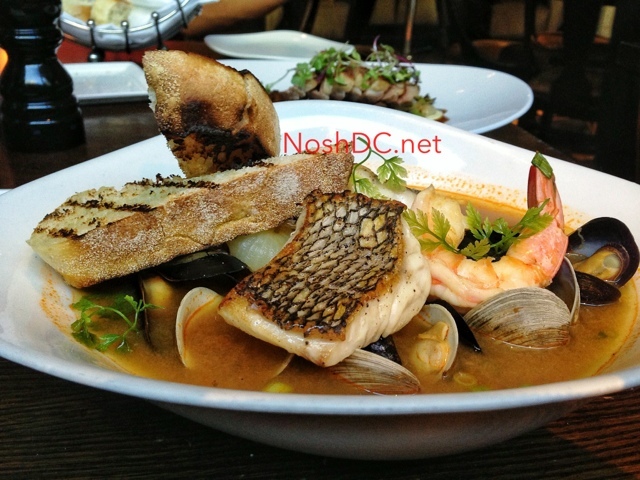 Check out the reviews of some of my favorite DC restaurants! Founding Farmers is a very popular spot in DC. Especially brunch where a 20 minute waiting list is common. Although I am very familiar with their brunch I’ve only had dinner here once and it was about 2 years ago so I had little memory of that experience. I was actually headed someplace else close by but for most restaurants the norm is to begin serving dinner at 5 or 5:30 but it was 4:15 and we were ready to eat. So we called up Farmers and heard those wonderful magical words everyone longs to hear ….”we start serving dinner at 4pm”. It was like we heard dinner bells, so AP and I headed down the block. This location is a 10 minute walk from the White House on the way towards Foggy Bottom. The lower level dining space feels very open as you are surrounded by glass with views of Pennsylvania Ave. Like most restaurants in DC, there was no sign of little people but I imagine this would be a nice venue for families. Farmers has a great menu in that they have a large selection of dishes while not overwhelming with too many choices. Having said that, it was difficult to make a decision because of the great options. While AP was trying to decide between the Skirt Steak or Chicken and Waffles, I was thinking about the Braised Short Ribs, Shrimp and Grits or Pot Roast. The menu is not pretentious. Its filled with what I like to call Sunday food. Pot Roast, Ribs, Pork Chops, Mash Potatoes and Skillet Corn Bread….take a look here for yourself. I really don’t think you can go wrong with any of our choices but we finally decided on the Chicken and Waffles and Braised Short Ribs with Mash Potatoes and Mac n Cheese as sides. AP asked the servers opinion on the Chicken and Waffles and her response was that its the best dish on the menu. Well, AP and I have both been to the originals Roscoe’s Chicken and Waffles in LA and have very fond memories so we were very skeptical as to exactly how good this dish could be. Looking over the table it felt like a classic Sunday dinner arrangement! AP and I were very happy with everything we ordered and Roscoe’s better watch their back! Take the metro blue or orange line to Farragut West then about a 10min walk. Located downtown next to the Newseum behind the DC Superior court building, The Source is someplace you want to put on your TO DO list if you haven’t been already. Like most folks, I tend to visit the restaurant website to get an idea on prices and selection. The Source website was interesting and very busy. I had to actually give it my attention to navigate through the menu section. They have a total of 7 menus, yep 7, but no kid’s menu. I guess that would have been one too many. Anyway, VH1 and I decided to head on over to see what the hype is all about. We usually book our reservations early for dinner. One because we have jobs where we can sneak out early without being noticed and two because we are hungry from starving ourselves all day so that we are sure to order every possible course and enjoy! I walked over from the metro green line at Archives and grabbed a seat at the bar to wait on VH1 who of course did valet. The bartender – that word seems so ancient, promptly came over to say “hello” and gave me a few menus. One was a drink menu, another wine and the third was bar Nosh. Actually the Nosh deal seemed pretty good for $22 bucks but when I saw the drink menu I almost fell off the stool. Yes, I know I am super cheap for a foodie but $14 drinks…really? Really? I just kept staring at this menu thinking WTH so I asked, “excuse me do you guys have any happy hour specials”, nope but you can order a regular drink. So I got my standard, Vodka with anything and guess how much that was….$11 bucks and with the tip I was back at $14. Before the drink came VH1 was there and it was like déjà vu with the 3 menus yada yada and finally she goes…. “$14 bucks, they don’t have a happy hour” (giggle). The bar area was a good size for DC standards and very polished. Cushy seats, communal tables, couple of small tables and the bar. We thought it was pretty slow for a Friday, compared to most spots in DC by 6pm. The Source is really swanky just like I like it with lots or marble, glass and stainless steel all over the place…ahhh. I guess that don’t come cheap. I would suggest putting forth a little effort with the outfit if you come here and I would imagine this would make a great date night destination. Not really a jeans and t-shirt kind of place and not especially kid friendly. I imagine they have a kid’s menu someplace but I’d guess they’d probably prefer not to dig it out. The hostess popped over to confirm we were ready to head up to our table and placed our drinks on a cute little tray and we followed her upstairs. Again, not many folks up in the dining area yet which was nice so we kinda had the opportunity to linger and glance a bit more at the views. This level also had floor to ceiling windows and a narrow outdoor seating area. I think there was also outdoor seating on the ground level too but who’d want to sit outdoors when you have a nice setting like this! Let me mention that the staff did nothing to add to this experience. They seemed like cyborgs to me, in matching outfits. Not saying that they were rude or anything, on the contrary, they were extremely efficient but in a much rehearsed sort of way. Okay, now to the food. O-M-G it was so good. THE END! Just kidding, we were so early that we did not have the opportunity to see dishes passing by and say…ooh what’s that, let’s try it but as it got busier we saw so many things that looked incredible but our selections did not disappoint. We started with the Pork Belly Tiny Dumplings and Crispy Suckling Pig and yes it was agonizing making a decision – I wouldn’t wish this punishment on anybody. My mouth is watering right now…these were both outstanding! The dumplings were perfection and came with a side of Lo Mein noodles. The Suckling Pig was not what I expected but, well take a look at the pic. This was very good too. Second course, again just as agonizing to choose but we eventually went with Lacquered Chinese Duck, yep both of us. So funny, VH1 originally planned on going with the Tasting Menu with wines until she saw the sticker. I won’t give that away, I’ll let you experience as she did (giggle) BUT if you have a pair of those Google glasses you can probably peep the price online. The duck was excellent, almost as good as this place I experienced in Beijing last year, with the crispiest skin ever, truly lacquered. I would say that it was a little more done than I prefer but still outstanding and neither of us could finish it all. Now for dessert, menu 3 of 7, I got the 15-layer Carrot Cake and VH1 went with the Cookies. Our waiter mentioned that the Carrot Cake was voted one of the top 10 in the city and since I am a sucker for that sort of talk I focused on the cake. VH1 on the other hand is a bit more sophisticated and went with the cookies which were these large warm chocolate chip cookies – crispy not chewy- the presentation was nice too. I prefer a little crunch as opposed to chewy so I snatched up a few to take home. The carrot cake did have 15 layers, so moist and not too sweet. Look, what can I say, The Source lived up to the hype guys. So if you are interested in that Tasting Menu for you and your date, grab your gold platinum card and head over for a treat. So we had to stop by to pick up travel Visas nearby and wanted a bite for dinner when I said, lets try this place around the corner – Urbana. I had brunch here a while ago and remembered how much I enjoyed it. It was happy hour so we decided to have a couple of drinks. The atmosphere is very inviting and friendly. The bar area has a cozy seating area, plush sofas for groups to mingle. Also they have drink and nosh specials which is ALWAYS appreciated. Its unusual to see drink specials for $6 using Absolut liquor so this was especially nice. I did not have the pizza but I don’t think you can buy a pizza at the grocery store this cheap. Folks, this is a very nice happy hour deal here! After our drinks we headed over to the dining room which is modern with an additional counter area where you can view the prep area and wood burning oven. This is a very nice touch, especially if you are a solo diner and prefer to stay away from a table. It was not difficult for me to make my decision as I started with the Lobster Ravioli followed by the Duck Breast. My partner for the evening had the Cacciuco and we shared the Gelato for dessert. The menu had nice selections —Pizzas, Cheeses, Salumi, Brussels Sprouts and lamb meatballs. Very nice!! Our serving team was very good. I think our server was Sasha. She was very attentive without being interruptive. A nice touch was when the entree’s arrived by one of the chefs. I for one can appreciate the little touches that provide special attention…it can make a mediocre meal into something special. BUT PLEASE UNDERSTAND there is nothing mediocre about Urbana. As you can see from the photos the food looks delicious. I will confirm that everything did taste just as good as better than it looks! The broth from the seafood dish was outstanding and the seafood itself was very fresh and moist. This dish along with the italian bread was outstanding. Classic comfort food. The Duck did not disappoint either. Once it arrived I realized that I didnt tell Sasha how I wanted it prepared but it was perfect. Tender and juicy….makes me want to grab my farecard and head out the door right now! The only thing that we were not as impressed with was the Gelato. I know that’s odd as I am not sure if this is something that is prepared onsite or from a manufacturer. Just wasn’t what I expected but the pastry that came along with it was excellent. If you have not experienced it, URBANA should definitely go on your to do list. Great service, sleek surrounds and excellent food – winning combination. Its located about 10 minutes from the metro red line Dupont Circle stop. Very good. I highly recommend this. Although the sprout were tasty I was not impressed, especially compared to most every place I’ve had them out in DC. Poste is one of my favorite go to restaurants in DC. One reason for this is the location. Poste is located very convenient to public transportation and other popular venues like the Verizon Center in Downtown DC. I am a sucker for sleek modern design and this spot always makes me feel a little like a rock star whether stopping by at happy hour for a little nosh at the outdoor bar, in the courtyard, brunch or dinner on the patio or indoors. 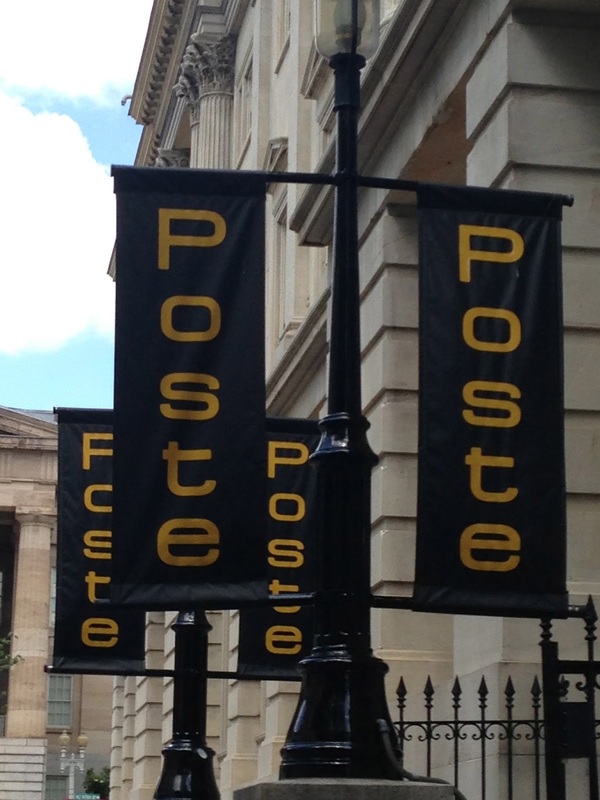 Poste is part of the Monaco Hotel in the Penn Quarter and on this particular occasion TR, VH1 and I stopped by for lunch. We decided to sit outdoors as it was an absolutely gorgeous day. The Courtyard has a raised patio area that over looks a garden with a bar and lounge seating. It’s so relaxing as they have shade and pumped in chill music…..ahh, I mean it’s really hard to say no to just one more drink! I’ve always had great experiences with the staff here and on this day there was no exception. I arrived first and grabbed our table and the server made an outstanding recommendation for a Basil Martini so I said, hey why not its past noon! Fast forward one hour and I am not sure how many we had but the bar tab for the three of us was about $90…yes this was lunch but we were not headed back to the office (giggle). It was agonizing trying to choose just one thing off the menu but finally I decided to go with the grass feed burger on the onion bun. OMG this burger was so flavorful and juicy. I didn’t think I would be able to eat it all but, one bite lead to another then another and the next thing I knew….all gone. Came with truffle fries. VH1 is not satisfied until she has something raw and slimy to put in her mouth sooooo, she chose the Croque Madame “Miss Crunchy” and was really satisfied as well. TR got there late (surprise) so she decided to basically drink her lunch…. as we were headed down for the Jazz at the Sculpture Garden. As you can see I recommend Poste. The food is consistently good as is the service and the venue. In fact, the outdoor area may be one of the best in the city. Take the metro red line to Gallery Place exit, order the Basil Martini, sit back and enjoy! So a few of us got together for dinner at Chez Billy. I gotta admit, finally an excuse to hang out in this part of town. Not unlike most parts of the District, coffee shops, restaurants and clubs are popping up all over the place and I’ve really never had a reason to head up to this part of town for dinner until now. Chez Billy has been open for about a year and I could kick myself for not getting here sooner. From the street it does not really impress but once you walk into the main bar area you get a feel for what to expect – to be wow’ed! When they say they open at 5:30 they mean it. Our reservation was for 5:30 and we arrived at about 5:25 and had to wait on the sidewalk until they unlocked the doors….which was actually at 5:33. It would seem that they would open the bar at 5pm so that folks do not have to time their arrival perfectly for 5:30pm. I mean they could potentially have 20 folks with reservations that show up 5 mins early and everyones on the sidewalk waiting….not a good scene. Once we stepped in the door that was all forgotten because …well take a look at this pic. The interior is impressive and larger than I expected. They also have an outdoor area with a bar that must really be nice for happy hour on summer afternoons. VH1 and I arrived on time, as usual while VH2 and IF came late, as usual so we sat at the bar to enjoy a drink with the bartender Roger. Chez Billy does have happy hour prices at the bar and the wine was very nice – Pinot Noir. Ask Roger to give you the details about the history of the building, it was very interesting and he was really nice. Finally we were all ready to head to our table and the team that waited on us that evening was fantastic. Don’t forget to ask for recommendations because it was very helpful for us and spot on. From here on out I pretty much could just post the pictures and be done and just say head here but let me give you a few details on what we had. Note, everything and I mean, everything was outstanding!!! View the menu here. VH1 started with the Tartine aux Champignons, then Beef Cheeks, and Crepes. VH2 and IF started with Blood Sausage and Whipped Pork Belly, followed by Steak and Mussels and I of course had the Duck for entree, started with Whipped Pork Belly Pate and Profiteroles for dessert. The Mushrooms were p-e-r-f-e-c-t-i-o-n. The Pork Belly spread on the toasted bread awesome, you gotta try both of these to start. VH2 enjoyed the Sausage and mentioned that her Steak was prepared very well and very tender. I sampled IF Mussels and wow, outstanding. The Duck delicious and VH1 Beef Cheeks so tender and flavorful. Like I said the meal was perfect. I really recommend Chez Billy and it couldn’t be easier to find. Take the metro green line to Georgia Aveune stop. If driving it shouldn’t be too difficult to find a meter. We are so lucky to live in the Washington DC metro area. We have access to three airports, two of which are international. We have a very diverse community with access to cultural venues and events. We do not experience extreme weather conditions except humidity. Close to other major cities (NYC & PHL) and we have good education systems and a plethora of fine dining to choose from. In particular Washington DC seems to have more than its fair share of French restaurants. My parents and older sister closed up shop and moved back to Washington DC after being gone for two years. At the time I was two months old so I pretty much consider myself a native Washingtonian. For the most part, it seems like folks who live in DC are from someplace else where French food is not necessarily the most poplar thing going. Texas is known for BBQ, Chicago for pizza, Philadelphia for cheesesteaks, Seattle for coffee, New York for cheesecake but DC….ahhh, French food? I mean you gotta admit, DC does love its french restaurants but I am not exactly sure why. Le Diplomate is a new Frenchie located where else, 14th Street NW. This restaurant is VERY popular so if you plan on going here you will need a reservation. Let me explain how popular this restaurant is. I got on the 52 metro bus headed north and asked the driver if the bus goes close to the 1600 block of 14th Street. The driver looked at me and immediately asked “you must be going to that new French restaurant right”? I gotta admit that caught me totally off guard but that’s how popular this place is which leads me back to the question of ‘why are French restaurants so popular here in DC’? I’ve met so many people who just LOVE Paris. I’ve traveled a bit in France and did visit Paris and its not really one of my favorite cities. Paris reminds me of NYC in that its a big concrete metropolitan city and I do want to go back one day but I would not necessarily say that its charming, but that’s just me. Having said that there are two things I LOVED about that country, the museums and the FOOD. In particular those nice outdoor cafes and bistros. Maybe that’s why the locals seem to flock to this french spot because it reminds them of Paris. Normally to draw the level of excitement that Le Diplomate has in DC you need to have “farm to table” or “locally grown” on the menu. This normally gets everyone excited for some reason but I don’t think Le Diplomate indulges in that concept. Instead it relies upon appealing as the quintessential french cafe. Although I’d heard the buzz about Le Diplomate, VH1 asked me to make a reservation. Well, I don’t even think the Salahi’s could have conned their way into this place within a week of trying. This was about a month ago and the only tables they had within 7 days of our choice was right at the 5pm opening for dinner so we jumped on it. Once inside I realized that the place is actually not very large. We were lucky enough to get an outdoor table and I would suggest the same. They do have a bar that I image will seat you without a reservation but good luck with that. Also the noise level indoors was very high once it got busy which gives another reason to sit outdoors. I noticed a table that had “reserved” posted which I guess they hold just incase Michelle and Barack have a last minute date night. Unfortunately they didn’t show up the night we were there. In fact no VIPs dropped by as it remained unoccupied the entire time. The server and staff where very good but nothing exceptional. The menu has the basics with about 12 entree’s, with plenty of seafood hot and cold hors d’oeuvres, some sides, cheeses and a large selection of wines. Each night for dinner they have a special selection on the menu. We had the rabbit so I guess our visit was on a Thursday. The server recommend the dish and mentioned that they normally run out fairly early because its very good. Well that’s all he had to say. VH1 and I got the rabbit while VH2 went for the TarTare, along with a couple of bottles of wine. Oh yeah, and the regional cheese selection of 7 different cheeses. Yikes almost forgot dessert too. We had the Apple Tart Tatin and the Rum Soaked Baba. The rabbit was served with carrots and dumplings. The meat was very moist and nicely portioned. Carrots cooked just right and the dumpling served well instead of maybe potatoes. VH2 enjoyed the TarTare but everyone was less impressed with the fromages. I think we expected that the selection would knock our wigs off but it was pretty much on par with most venues on the block. The deserts were outstanding and worth every calorie! I enjoyed the Apple Tart best. We are already making plans to go back but this time on a Monday for the Veal Sweetbreads. Well its confirmed, the food was very good. We were very happy with everything we ordered, the service was great and we enjoyed sitting outdoors enjoying the view and the nice weather…you know what..I guess it did actually reminded me a little of Paris! If you are from out of town or just want a little bit of Paris for one night, to get to this popular destination, take the metro green line to the U Street station then about a 15 minute walk or take the 54/52 bus north or from where ever you are, just walk up to anyone on the street and ask “how do I get to the Le Diplomate from here” and chances are they will know. Cork Wine Bar – Michelle Has Been Here! I’ve never worked in a restaurant before, wait does McDonald’s count (I was in high school), so sometimes I use my imagination to fill in the blanks for unanswered questions. Like for instance, if a restaurant has several duck entrees leftover at the end of the night what do they do with them? Do they throw it out, give it to the staff…what??? Hmmm just wondering…imagine that could get expensive. Anyway, I’ve meet up with friends at Cork several times over the last month. I really like this restaurant. There is nothing ‘outstanding’ about the venue or staff, I mean no complaints just nothing special except for the bartenders. They were able to answer all our questions about the wines and made great suggestions. The food and wine are the stars at Cork. The restaurant is small and sits within a busy block along 14th Street, it’s not hard to miss this place since there are so many eateries opening side by side for blocks. You’ll want to sit in the front section of the restaurant so that you can have a view of the street. They also have a small outdoor area of about 4 small tables and the bar sits about 10. You probably don’t want to stroll up expecting to find a table for dinner without a reservation so make sure to plan ahead if you can. Its amazing that there are so many restaurants all over the city and most of them have a little something distinctive to offer. A popular dish here that I love is the avocado on grilled bread with pistachios, pistachio toasted oil and sea salt….OMG this is so darn good. The toasted fries are sprinkled with a delicate lemon zest. I think they are prepared with duck fat but that just might be my wishful thinking, doesn’t matter because they taste like they are prepared by little french fry angels….yep my mouth is watering too. Now for the pièce de résistance, the Duck Confit with braised red cabbage, whats better than outstanding? Let me mention the first time I had the Duck here I swore I found the love of my life, I fell hard…yep that Duck got me all twisted. The second and third times ahhhh the bird didn’t seem so fresh. As you can imagine this broke my heart, but I had fallen hard and wasn’t willing to throw in the towel and still willing to give this Duck another chance! You might also want to try the braised kale. I don’t see kale on many menus I guess because they don’t want to compete, Cork does it so well. My friend TR enjoyed everything she had (her Calamari and Shrimp was good), VH1 got the cheese board and it was good and VH2 got the Charcuterie and yep it was good too. You see the trend here…..this place is good. You should go. The walk is not bad from the metro green line U Street station. Almost forgot, stop by the Cork Market down the street to buy some I that wine you have with dinner. I’ve lived and traveled to more than a few cities in my life and I can’t think of any place more conservative than DC. 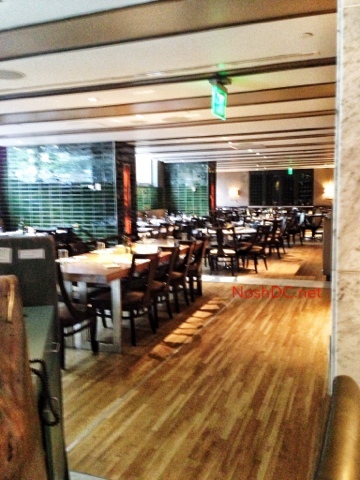 Having said that, the J&G Steakhouse dinning room was a text book conservative DC eatery. We picked this place because it was close to a show venue and we wanted to experience the roof top bar along with dinner. Let me just mention that there are a few things that I refuse to do in life. One is pay $12 to dry clean a dress when dry clean depot only charges $2. Two is pay $15 dollars for a shot glass worth of liquor that actually costs $2 and third, pay $20 for valet parking when everything in this city is within 5 blocks of a $2 metro ride but that’s just me. Well on this occasion I was actually being treated to drinks and dinner so guess what, I ordered that $15 drink and guess what else, yep it tastes just like the happy hour $8 drink around the corner. The restaurant is located in the W Hotel. We walked into the hotel lobby, this is a Starwood property, and I expected the interior to be very swanky and modern but of course it was a lot more conservative but still very nice as expected. We made a bee line to the elevators to head up to the rooftop bar to grab a quick drink before dinner but a very nice gentleman met us and asked if he could assist. We said nope, we are going up to the bar but thanks. Well, he told us that there was a private function for the evening and asked if we’d like to take our drinks at the lobby bar. So I didn’t have a chance to check out the roof top bar but they still had the $15 drinks in the lobby (giggle). BTW, this was during the same time as the White House correspondence dinner so I imagine that the guest list on the roof was worthy of hollywood. Before we knew it our reservation was upon us so with drinks in hand we headed over to the dinning room. The ceilings sprang up at least 2 levels and the staff whisked around in black vests, crisp white shirts, very professional but friendly. I could tell that most folks inside were hotel guests and I noticed something strange! There were actually children in this restaurant. I mean kids that take booster seats. I don’t know about you but outside of Eastern Market, aka, the Stroller District, I RARELY see kids at dinner in DC. It was refreshing as living and working in the same DC neighborhood I can go a week without seeing a little person. Anyway, we decided to order a bottle of red wine and asked the server for a suggestion. I can’t remember what he brought back (I normally take a pic because I can never remember) but it was marvelous smarvelous. We decided to try the pre-theater menu and a la carte and started off with the Heart of Romaine Caesar Salad and Bacon Wrapped Gulf Shrimp Passion Fruit Mustard, Avocado. The Salad was outstanding. The romaine was intensely fresh and sweet. The cheese and dressing was very light, perfection. The large wrapped shrimp was incredible. Again, fresh and flavorful, just perfect. For the entrees, we went beef all the way and had the Petit Filet Mignon with fries and Short Ribs Vinaigrette Sugar Snap Peas, Jalapeño with a baked potato. The beef was so tender and juicy prepared just right with the Jalapeño adding the perfect hint of heat. Every bite of the potato was perfectly cooked I mean perfect. Finally, for dessert we shared the ice cream and sorbet. We both took a spoonful and looked at one another with looks on our face like, yep this is so good. We were beyond satisfied with our meals and it actually was not really expensive, well worth it. J&G is about 2 blocks from the White House. Take the metro red line to metro center and run don’t walk to J&G! 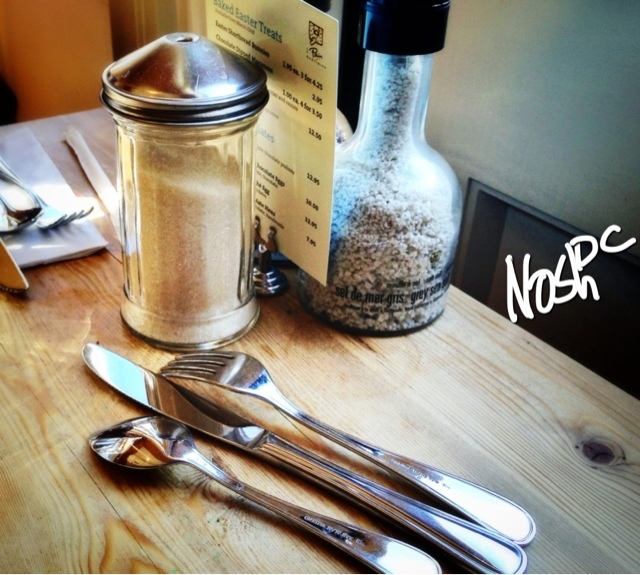 Le Pain Quotidien is a lovely little gem. Its different from most eateries we have in the DMV and I just love it. It’s a cozy setting, great place to meet up with friends at their communal tables made from reclaimed wood, solo or weekend mornings for a little Nosh on your way to the flea market. I normally visit the Tyson’s Corner location, right outside of Bloomingdales, (I think it’s competing with the Café in Nordstrom) Downtown near the White House or Clarendon in Arlington. I think they do well at giving you the feeling of a Belgium or French café. I will say that the Eastern Market location seems to be a little challenged sometimes, maybe some leftover bad qi from the old Bread and Chocolate, as it is usually very busy on the weekends. Although smaller than the other locations they have outdoor seating creating a prime spot to people watch when the weather is nice. I think they have a rotating seasonal menu and the selections range from ….well check it out here. 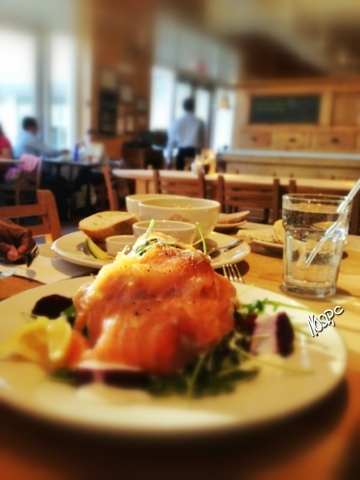 Le Pain Quotidien food is consistently fresh which keeps me coming back. I normally get a salad – Salmon and Beet Salad or the Soup of the day – Chicken with Quinoa. They also serve breakfast and of course all variations of tea, coffee and Belgian Hot Chocolate! You can reach the Eastern Market, Farragut West and Clarendon locations on the metro orange or blue lines. This outfits seems extremely aware of the concept of ‘competition’ and when I am there they seem to constantly focus on getting it right.